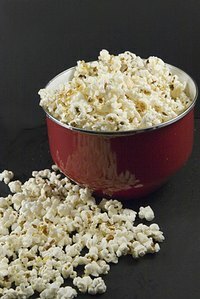 Whether you make popcorn on the stove, in an air popper or in the microwave, sometimes not all of the kernels will pop. This happens for a variety of different reasons. In some cases, the kernels may not have had enough internal moisture to pop. Other factors include uneven heat or inadequate time to pop all of the kernels. Instead of throwing these unpopped kernels away, re-pop them. Remove the unpopped kernels. The heavier unpopped kernels will typically accumulate in the bottom of the bowl or a bag of popcorn. Remove all the popped kernels and pour the unpopped kernels into a small bag. You can use a brown paper bag or a plastic bag if the kernels have cooled. Clean off any salt or butter/oil on the unpopped kernels. Take a damp paper towel and wipe the kernels off, or if you prefer, place them in a strainer and rinse them off. Dry them thoroughly with a fabric or paper towel before proceeding. Store the unpopped kernels. A resealable plastic bag works best for popcorn kernels. This will help prevent the kernels from drying out. While you don't want wet kernels, they do need a least a small amount of interior moisture to pop correctly. A sealed plastic bag will prevent any excess air from drying the kernels out. When you have at least 1/4 cup of unpopped kernels stored, you can re-pop them. Pour the unpopped kernels into a small, brown paper sack. While you can re-pop the kernels on the stove or in the air popper, a microwave will typically work best for re-popping. You can make your own microwave bag with this brown paper sack. Fold over the top several times to seal the bag. You do not need to add any oil. Microwave the paper bag for two to three minutes, depending on the power of your microwave. Set your microwave for three minutes and listen to the popping. Once there is a period of more than 10 seconds in between pops, the popcorn is done. Pour the popcorn into a bowl. This method should have re-popped most of the kernels. If you find that there are some that still did not pop, they should be thrown away at this point.